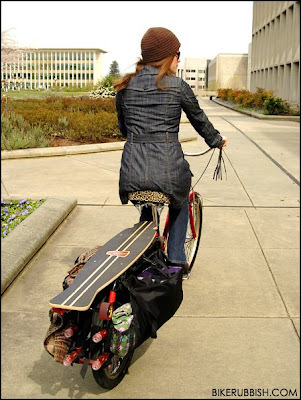 Another splendid photo from Derek at Bikerubbish.com, documenting, as ever, the shockingly chic bikes and ladies in his life. This is one of the only lycra photos you'll ever see on this blog. Taken by a French acquaintance, Guillaume Reguer, it's a great unicycle shot. Sorry about the lycra. Seriously. Really sorry. It won't happen again. Once again, it's not just us. I wear padded lycra shorts for comfort. But they're well hidden beneath normal looking clothing. At my age it the best place for it! ...for comfort when cycling more than a few miles, I hasten to add - you cheeky man. The big wheel one the unicycle helps you ride a lot faster. I have been riding one for the last 8 years. My max speed has been 36 km/h. That is very scarry, because you can not run that fast if you fall! Some years back we rode from Copenhagen to Skagen, a trip on 600 km in 9 days. 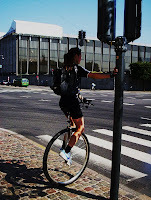 there's a kid who always rides his unicycle down on falkonér plads in frederiksberg. looks cool. Anyone else notice how in the French poster at the bottom, the shadow cast by the handlebar and brake cable resembles a garter belt on her thigh? well spotted! a nice detail. thanks. the third photo was sent to me by a reader. i couldn't find out where it originated.